2016. A year full of lists. Over the last year I’ve created lists of all shapes and sizes to organize stuff. 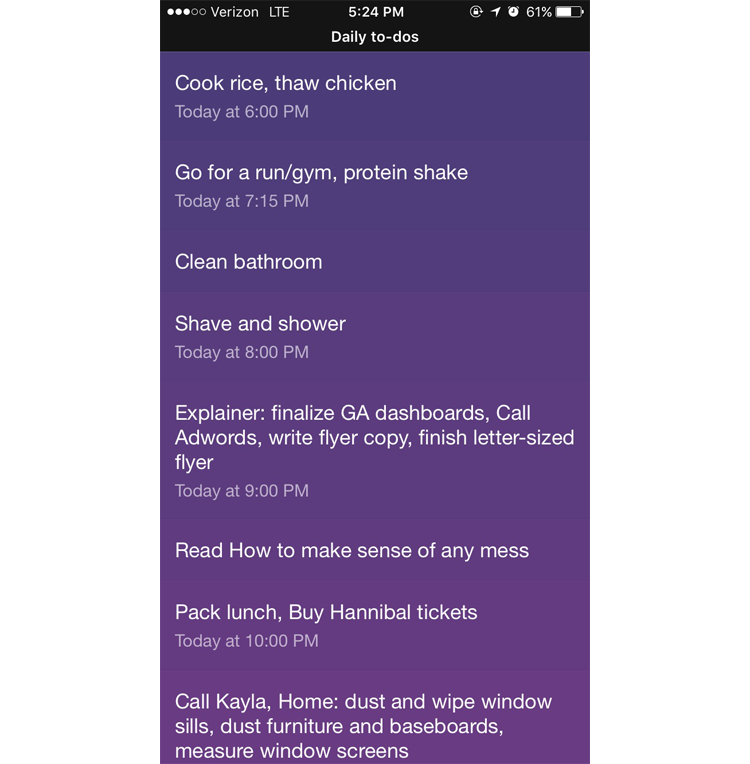 There was a constantly evolving list of daily to-dos. I wrote my monthly goals in a separate list. I kept a list of tasks like ‘return library books’, things I can’t waste memory trying to remember. 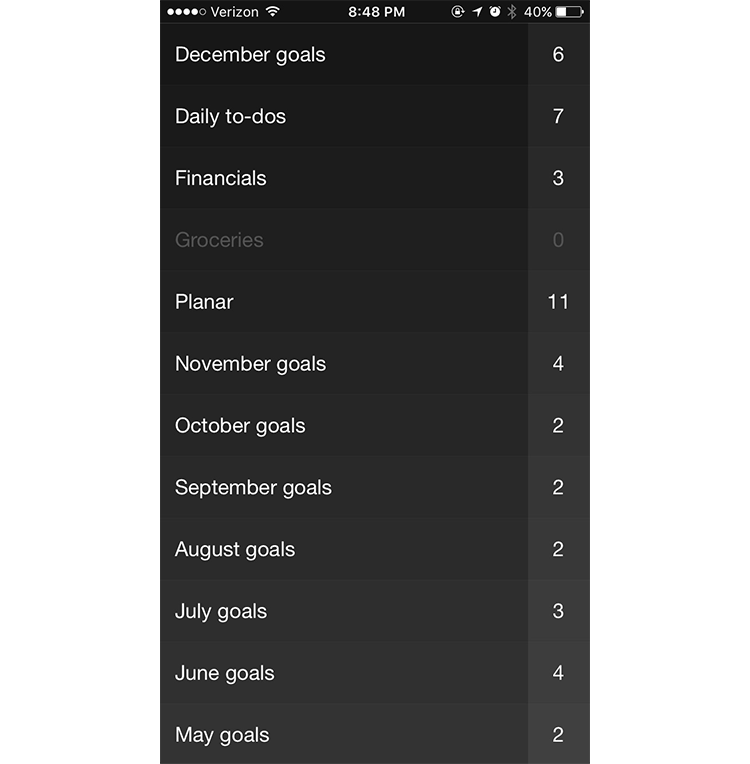 I created project specific lists, grocery lists, checked them every day, and used the app Clear to manage all of them. Checking these lists became a daily habit. If I was bored or noticed I wasn’t doing anything, I’d check my lists and see what I needed to do next. Did I need to take out the trash? Work on one of my side projects? I did my best to track my goals, see what worked, what didn’t, and hopefully try those goals again. I did this for over a year. I failed, succeeded, and then failed again. I didn’t accomplish everything, but I did get some make some progress. I know because I documented it the whole way. I kept my lists in a certain order. The current month’s goals were at the top. Followed by my “Daily to-dos”. 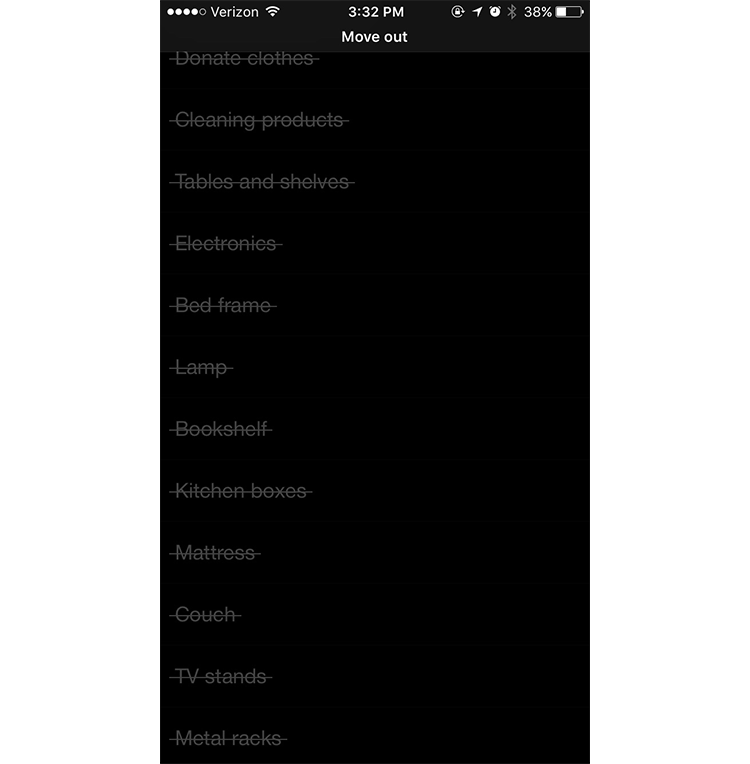 Then financial reminders, groceries, and project-specific lists. After that were previous month’s lists and finally my “Long-term” list. This list was constantly evolving and included tasks from other lists. Everything I needed to do eventually made it’s way onto this list. It included tasks for the monthly goals I wanted to accomplish, tasks from my project-specific lists, and other tasks such as taking out the trash, cleaning, and getting groceries. I used reminders to notify myself when I needed to do certain things. 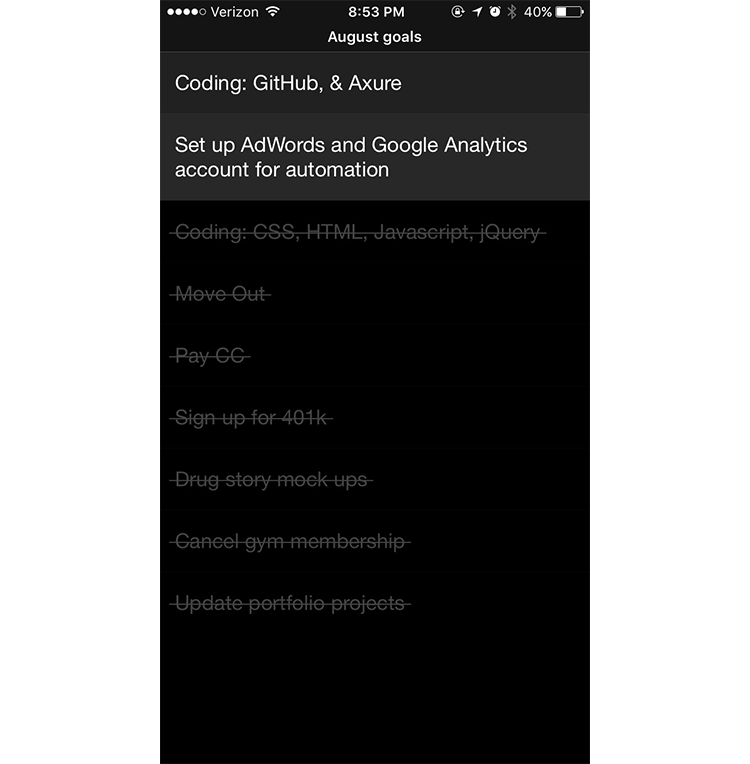 This list was constantly being re-arranged, which was relatively easy with the app’s drag and drop interaction. I checked this list throughout the day, always seeing what was up next. This list included tasks from other lists, some were grouped together for ease, and I used reminders A LOT. Every month I made a couple of goals I wanted to accomplish and put them in it’s own list. When I populated my Daily list, I would double check this list to see if I was on the right track. Crossing off items made my daily list very motivating. The act of swiping to ‘cross off’ an item and hearing the ping for finishing a task was nice. But, many of my monthly goals weren’t accomplished within a month. Those goals were in next month’s list and now looking back, I can easily see which goals were harder to achieve than others. August was pretty productive, although every month did NOT look like this. Unsuccessful goals we re-assessed or moved to next month’s list. I would never have remembered this stuff if I didn’t write it down somewhere. I learned a lot. I learned about goal setting, time management, and how little self-discipline I actually had. However, I was successful here and there. I “learned to code”, applied to and enrolled into a graduate program, and started a couple of side projects. In theory, it’s simple. If you want to do something, write down what you need to do and go do them. Easy, right? Not really. It’s important to quantify those goals, be descriptive, and realistic. Instead of “Fix website”, what exactly are you updating and with what? Instead of “Work out”, when are you going to work out and what are you going to do? Help yourself by being as specific as possible. Plan less and do more. Making a game plan is great becuase you’ll never have to figure out what to do next, you’ll already know. But, we don’t live in a perfect world nor can wee sense the future. There were times when I should’ve stopped thinking about the next steps on my list and started doing the first or second. I really wish there was a better list app. Clear was great, and for a while it sufficed. But, as I used the app more, I realized there were many features that I wish I had. I would’ve liked for add tasks from other lists or “tag” tasks to further organize them. Not every task is organized by goal, some tasks were organized by “time it took to finish” or the nature of the task. It was helpful having these lists act as my second brain. But, I don’t know if I’ll continue this habit. Checking this app multiple times everyday for the last year has become second nature and given me a bit of anxiety. Could I still be productive with a less meticulous method? Maybe. I guess taking a break in 2017 is the only way to find out.